If you have your eyes set on Europe, you’re not alone. Last year over half of the world’s tourists spent time in the region and interest is not slowing down, with Europe seeing the second-largest growth in tourism despite its long-standing position as a leader in visitor arrivals. As consumers look ahead to spring and summer travel, the data science team at Hopper analyzed its real-time feed of over 25 billion daily flight prices to help travelers book travel to Europe the cheapest and smartest way possible. Flights to Europe are Cheapest in 3 Years: Average prices for round-trip tickets to Europe in spring are the lowest they’ve been in the last 3 years. With prices currently averaging $637 round-trip, airfare is down 15% from the same time last year. 20% Discount for Spring vs. Summer: Round-trip tickets to top European destinations are around 20% cheaper in the spring months than in the summer months this year. Trending This Year -- Millennials’ Top 5 Most Popular European Destinations: 1) London; 2) Paris; 3) Rome; 4) Madrid; 5) Amsterdam. Brexit Keeps Costs Low: Currently, the British pound is trading at around $1.30, which is the lowest level seen since the 1980’s. With Brexit set to happen this spring, it’s likely the pound will see a further drop in value, making travel to the UK even more attractive for wallet-savvy travelers from the US. 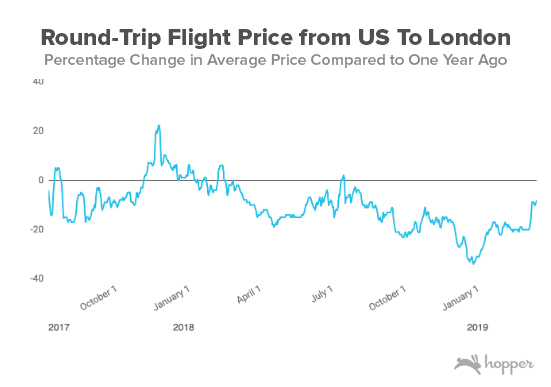 Moreover, round-trip tickets from the US to London have been falling long term, and are likely to remain low in the short term. 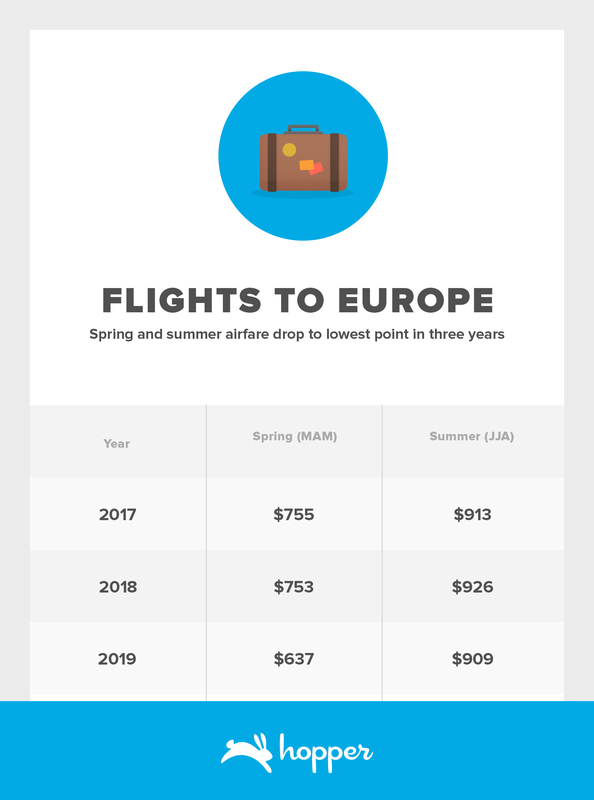 Average prices for round-trip tickets to Europe in the spring and summer months are the lowest that they have been in the last 3 years. 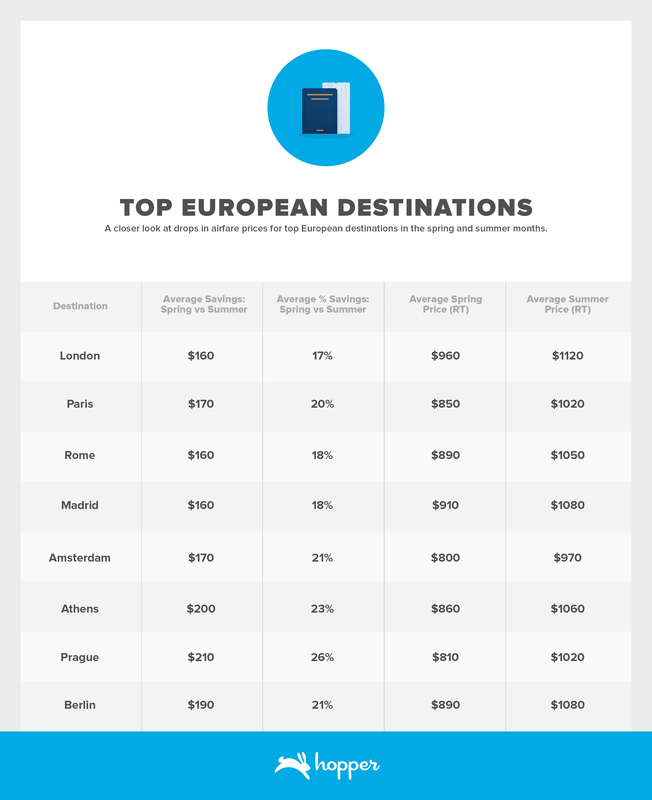 Round-trip tickets to top European destinations are around 20% cheaper in the spring months than in the summer months. *Deal Price: The price consumers should expect to pay with flexibility and advanced planning for economy-based tickets. Currently, the British pound is trading at around $1.30, which is the lowest level seen since the 1980’s. With Brexit set to happen this summer, it’s likely the pound will see a further drop in value, making travel to the UK even more attractive for wallet-savvy travelers from the US. When citizens of the UK voted to leave the EU in the Brexit decision in June of 2016, the value of the British pound dropped immediately and significantly. While there has been some recovery since 2016, the pound continues to trade at lower levels than the UK maintained in the early 2000’s. When the UK officially leaves the EU this spring (pending negotiations), the pound will likely see an additional drop in value, meaning the dollar will go even further in the UK for US tourists. Round-trip tickets from the US to London have been falling long term, and are likely to remain low in the short term. Prices respond to demand, so if there is a drop in tourists from the EU seeking to visit the UK post-Brexit, it could mean airlines will need to lower prices further to fill seats. Additional border controls and new processes for EU and UK citizens travelling post-Brexit could result in longer lines at customs, as airports across Europe implement new processes for border crossing.